Not-So-Happy New Year: Rail Website Woes In China Chaos inevitably erupts in China each year when millions of people swamp the transport system as they return to their hometowns for Lunar New Year celebrations. This year, authorities thought selling tickets online would make things easier. Instead, it led to long waits and short tempers. During China's Lunar New Year holiday, more than 200 million people will travel home. 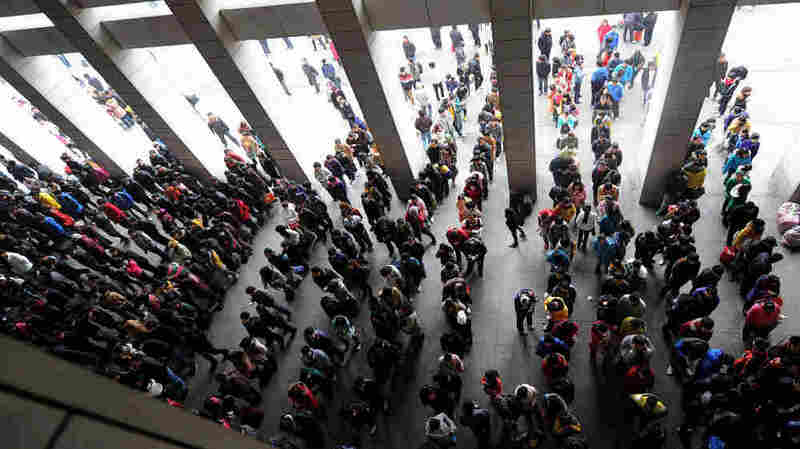 It's the world's largest annual migration, and every year, Chinese tell horror stories about trying to get train tickets. 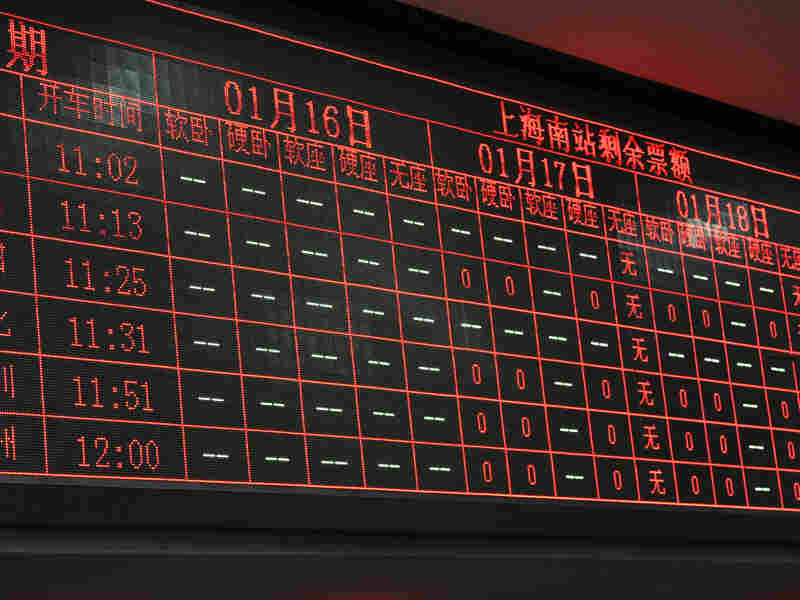 This season, the holiday falls on Monday, and it was supposed to be different: For the first time, China's rail ministry created a website to reserve seats. But things didn't work out as planned. Volume on the new train ticket website has been so heavy — one day it got 1.4 billion hits — that it has often crashed. Other times, the website charged people money without actually giving them tickets. A migrant worker surnamed Li said he had to strategize with colleagues to reserve his ride home to see his family in far western China. "I found several co-workers and we used three computers — three computers — continuously for five to six hours," said Li, as he warmed himself in a pedestrian underpass at Shanghai Railway Station. "Then, we finally got into the site and ordered two tickets." Huang Qinghong's experience was even worse. An electronic board at Shanghai Railway Station shows many trains sold out for Jan. 16-18. China's Rail Ministry spent more than $8 million on the ticketing website — which crashed and sometimes charged users without actually giving them tickets. "I went to the station four times," said Huang, who is a driver for a hardware company in eastern China's Zhejiang province. "When I got to the window, there were no tickets left. Later we learned we could buy tickets online." Huang doesn't understand the Internet, so he had accountants at his company help. "But we couldn't get on the site," he said, "and even when we did, there were no tickets." Huang became so frustrated that he wrote a scathing letter to China's rail minister and a provincial newspaper. Huang not only said the ticket website was a mess; he also noted that the people who travel the most during Chinese New Year — migrant workers — have little education and don't know how to use computers anyway. "You guys sitting on couches in air-conditioned offices, sipping tea, smoking cigarettes and coming up with buying tickets online, have you ever considered our lives?" Huang wrote. "Have you experienced the agony of buying tickets?" The letter went viral, and Huang became something of a folk hero. "When I was interviewed by Chinese media, I said it's best if more tickets could be available at booking offices," he said. "Because if tickets are sold online before they are available at the train station, people with no Internet skills won't be able to buy them." On the day Li Xiusheng went to the Shanghai train station, he bought the last same-day ticket back to his hometown in central China's Anhui province. Li, a Christian, thinks it happened because of divine intervention. China's Rail Ministry spent more than $8 million on the ticketing website. Rail officials say they underestimated demand and have increased bandwidth. Earlier this week at Shanghai Railway Station, things seemed better. Ticket lines were only 10 to 12 people deep. Most tickets were sold out several days in advance, but not all. Li Xiusheng, who paints building interiors, bought a seat back to central China's Anhui province on the same day. "The ticket seller told me there was only one seat left to my hometown," said Li, an outgoing man, brimming with enthusiasm. "I said, 'Thank you. Thank you, Lord.' I gave the ticket seller an orange. I'm really happy." Li, a Christian, thinks he got the last seat because of divine intervention. 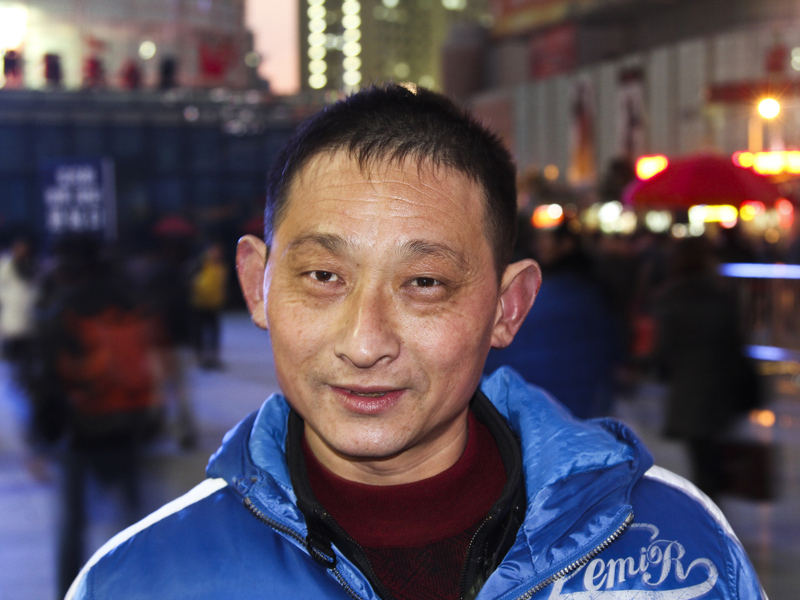 As for Huang Qinghong, the migrant worker who wrote that scathing letter, he finally made it home. Usually, his New Year's journey is a 30-plus-hour ordeal, but this year it only took two-and-a-half hours. That's because the newspaper he wrote to bought him a plane ticket. Speaking by cellphone from his village in western China's Sichuan province, Huang said it was only the second time he'd ever flown. "My fellow villagers all said flying must be very comfortable," Huang said. "They felt happy for me and they were envious."